The Azerite armor system has been a hotly contested since day one of Battle for Azeroth. Players feel they lack choice in the pieces they can acquire, and having to unlock access to Azerite slots again with each new tier hasn’t been fun. Spending time unlocking all of your rings only to lose access with the first drop in a new raid was a little maddening, and made it extra complicated to figure out if new gear was an upgrade. 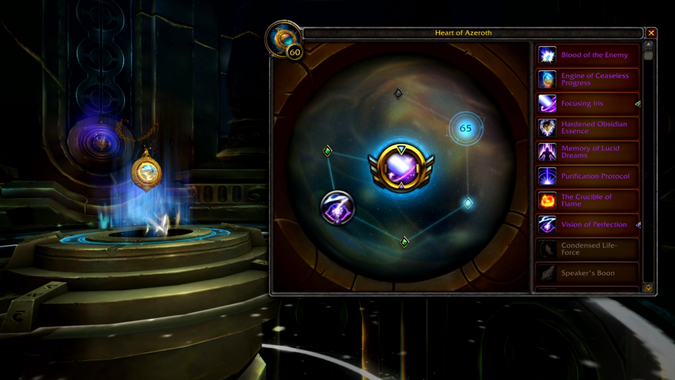 Starting with patch 8.2, all of the rings on your Azerite armor slots will be fully unlocked, giving you complete access to all of the powers as soon as you loot a new piece. 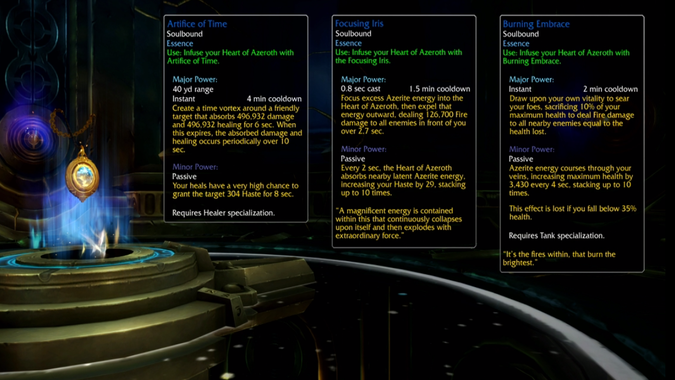 We’re also getting a major new progression path tied directly to the Heart of Azeroth itself. With the increase in Azerite eruptions across Azeroth, Magni and Mother have whipped up a powerful new Heart Forge to empower your Heart. You’ll unlock a progression system that’s reminiscent of the Artifact weapons from Legion but with way more customization available. Essences will be awarded from a variety of content and once you’ve acquired one it’s permanently learned. You’ll be able to swap any Essence in any slot by visiting a rest area or using a Tome of the Quiet mind — thankfully no trips to the reforger are required. The Essences you can slot will have major and minor powers. Major powers will give you a new ability to cast, while minor powers are a nice passive buff that will greatly benefit your role. For example, healers will be able to cast a time stop spell that absorbs damage and healing for six seconds, then staggers it out over ten seconds — something that could help when a tank accidentally pulls a bit too much at once. We don’t know what every Essence looks like, but Wowhead has a rundown of the Essences we’ve found so far. There’ll be three ranks of power for the Essences that increase the abilities and add some new secondary effects or extra charges to the activated ability. If you’re tackling the hardest content in the game, you’ll also be able to get a fourth rank, that gives your Essence a powerful new cosmetic ability, something to really make you stand out from the crowd. The preview shows a list of more than ten different learnable Essences that will allow for a great amount of customization. Having a second talent page that I can tweak on the fly from boss to boss in raids will be nice. The Azerite armor that is currently live never quite lived up to that promise. Having the extra step of needing to visit the reforger in the capital and the cost just made me look for a second set of gear when I needed to change specializations. The Heart Forge looks like a great way to finally deliver on the promise of what Azerite armor could’ve been. We’ll see more about this new system when patch 8.2 hits the PTR next week.